Updated Wednesday July 19, 2017 by Grafton Little League. 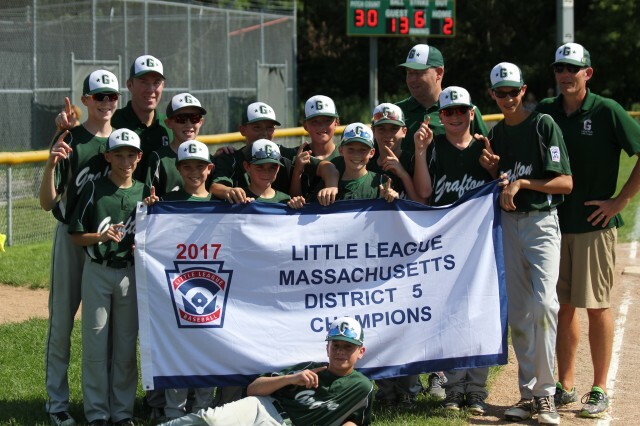 Congratulations to Grafton Little League's Major Division 11/12 YO All Star team as they won the District 5 MA Championship on Sunday by defeating Sturbridge 13-2. Grafton dominated its competition throughout the tournament outscoring them 83-8 and blasting twenty two home runs. Throughout Grafton's line up the boys hit the ball with authority and left little doubt in 2017 which town had the best team in the district. Grafton has moved into the State Sectional tournament where the final 16 teams in the state this year will compete for a state crown. Grafton opens play in states with games on Tuesday against Taunton East (on the road), Wednesday against Middleboro (on the road) and Thursday against Milton in Millbury at 7:00 p.m. The team began its quest for a District 5 title vs Oxford. Grafton would get an outstanding start on the mound from Brady Collins as he pitched five innings and gave up one earned run and struck out 6. Kevin Rauktis pitched the sixth inning and struck out two. The offense stars for Grafton were Ben Underhill with a HR and a two run double, TJ Cahill and Kevin Rauktis with doubles and Trent Gray with an RBI on a ground out. Grafton defeated Leicester in a mercy shortened game. Brady Keeler took the mound and pitched three shut out innings and struck out four to earn the win. Cam Papetti pitched one inning and gave up one run. Grafton would bang out 10 hits in only four innings. The offensive stars were Keeler with a 3 run HR, 2 runs and 3 RBI, Brady Collins with a 3 run HR, 2 runs and 4 RBI and Jimmy Lyver with a 2 run HR, 2 runs and 2 RBI. TJ Cahill and Papetti also had two hits for Grafton. Grafton beat Northboro in a mercy shortened game. The pitching star for Grafton was Kevin Rauktis as he pitched four shut out innings and gave up one hit and struck out six. Brady Collins would pitch one inning and give up one run. Grafton would collect 14 hits. The hitting stars for Grafton were Cam Papetti whom blasted two home runs, scored three runs and had four RBI, Jimmy Lyver with one home run, two hits and 2 RBI, Brady Keeler with one double and one single, two runs and 2 RBI, Connnor Dozois with two hits, TJ Cahill with a double and single, Ben Underhill with one double and 3 RBI, Brady Collins with two hits and 2 RBI. Grafton would finish pool play 3-0 and would earn the number one seed as the tournament moved to the elimination round. Grafton's sluggers would leave little doubt about the outcome of this game in this four inning mercy shortened game as they would explode for 15 runs in the bottom of the first inning, including five of the team's six home runs. Cam Papetti would blast two more home runs including a grand slam, score three runs and collect 8 RBI, Brady Keeler would go 3 for 3 with a double and 3 run HR, score four runs with 3 RBI, Connor Dozois would go 2 for 2 with two RBI, Ben Underhill was 2 for 2 with two runs scored, Jimmy Lyver was 2 for 4 with a home run, Kevin Rauktis would blast a three run home run, TJ Cahill would collect a hit and score two runs, Dominic Maynard was 1 for 3 with a three run home run and Brady Collins was 1 for 3 with a home run and RBI. Rauktis would start on the mound and earn the win. Collins and Keeler also pitched scoreless relief. Grafton's starting pitcher Kevin Rauktis was in control from the outset in this mercy shortened victory. He would pitch the first three innings and Brady Keeler and Cam Papetti would close things out in the fourth inning on the mound. The hitting stars were Joey Skowronek with a big bunt single early in the game and one run scored, Keeler was 3 for 3 with a hustle double in the first, three runs scored and had two RBI. After Millbury intentionally walked Papetti in the third innings to load the bases, Lyver would make Millbury rethink that decision after he blasted a grand slam to deep center field. Brady Collins would also hit a solo HR and score two runs, Rauktis was 1 for 2 with a double and 2 RBI and Underhill was 1 for 3 with 1 RBI and one run scored. Grafton rolled into the District 5 title game against a hot Sturbridge team that had a 6-0 record. Grafton would waste little time jumping on Sturbridge as they would score four runs in the top of first inning. Cahill doubled to lead off and advanced to third on a past ball. He would score on Brady Keeler's ground out. Cam Papetti and Jimmy Lyver singled and Papetti would score on a past ball making it 2-0. Ben Underhill would then hit a two run home run deep to left center giving the team an early 4-0 lead. Sturbridge would load the bases in the bottom of the first inning with no outs off Brady Collins but only score one run after Grafton turned an unconventional double play. Underhill fielded a ground ball and flipped to Keeler at second for the first out. The runner that took third rounded the bag wide and Keeler fired a strike to Lyver and a run down ensued before Papetti applied a tag at home for a the second out. Collins struck out the next batter to end the inning. Lyver homered in the third inning giving Grafton a 5-1 lead. Sturbridge would cut Grafton's lead to 5-2 in the bottom of the inning but Collins would work out of further trouble. One of the defensive gems was a great catch by Connor Dozois in foul ground along the first base line on a high pop up. In the top of fourth, Underhill would go deep for his second home run in the top of the fourth inning and Grafton's lead was 6-2. Grafton would bust open the game further as Brady Collins hit a three run homer in the top of the fifth right after Sturbridge made a pitching change making the score 9-2. Kevin Rauktis would then hit a solo home run and Cam Papetti would close of the offensive fireworks with a two run bomb in the sixth inning. Keegan Gilmore singled for Grafton in the sixth after working the count deep. Brady Collins earned the win on the mound pitching four strong innings with two earned runs and six strikeouts. Papetti would pitch the final two innings to close out Sturbridge, giving Grafton LL the District 5 title.